Turquoise & Sterling Silver Ring. 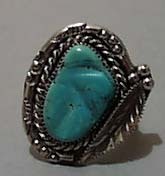 This is a turquoise and sterling silver ring size 8 1/2. The stone has a silver rope design around it. Next to that is more detailed silver. On one side of the ring is a sterling silver feather. A really nice piece of light blue turquoise. Measures 3/4" by 1/2". 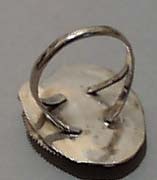 The ring measures across the top 1 1/8" by 7/8" Unmarked, but a really nice ring. In mint condition. Items Similar To "Turquoise & Sterling Silver Ring"